Interested? Request a demonstration or a quote!! 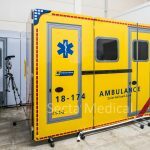 NEW to the Secta Medical product portfolio is the revolutionary Fold Away Ambulance. This versatile training aid provides a simple solution for students who need to experience working in the confined space of an ambulance. Realistic printed graphics simulate the space and environment of an ambulance. Fraction of the cost of a real ambulance. Easy and lightweight to transport with handy wheels. Space saving – folds flat when not in use. Bespoke artwork options available to personalize your ambulance. The Folded Ambulance is available to buy as a full kit or to hire. 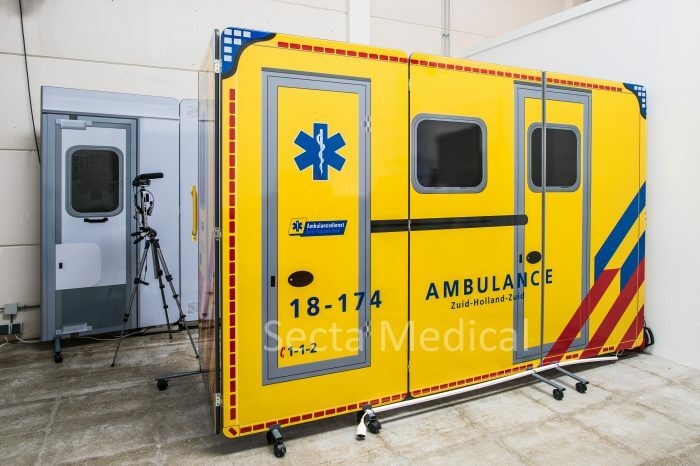 A fully working Folded Ambulance can be found at our showroom in Dordrecht, which also includes a number of camera capabilities. You can make an appointment to see our showroom in Dordrecht, the Netherlands, all our other products can also be found in our showroom. To find out more email info@sectamedical.nl or call us on 0031650234819.